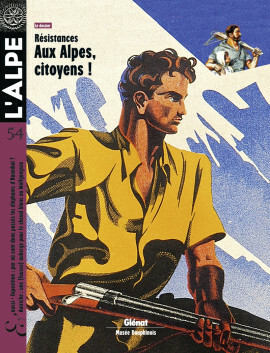 L’Alpe 54 : Resistance, To the Alps, citizens! Resistance in the blood ? In the collective memory, the Alps are definitely perceived as zones of liberty and the reputation of freedom-loving Alpine inhabitants contributes significantly to the myth. Comprising the Allobroges and Resistance fighters, including Protestants and the initiators of the French Revolution, the Dauphiné region is an excellent example. However, if History is a guide, that view must be tempered. Colonising the Alps was not a walk in the park for the Romans. Using guerrilla tactics and in skirmishes, the mountain folk revolted and badgered the legions, to the point of occasionally defeating them. Yet revolts such as those of the Veragri in Switzerland and the Salassi in Italy were sparingly documented by contemporary historians because in written history, only the powerful leave a trace. Were mountain peoples natural rebels during the Middle Ages ? Or rather highly independent groups resistant to outside powers, as is shown by the many revolts and acts of insubordination. Though quick to fight, they were also endowed with a strong community spirit and excellent negotiating skills that enabled them to win certain rights and liberties. Though with many differences from one end of the Alpine arc to the other. Peasants in the Alps rebelled against the demands of monks, the criminality of the administration and heavy taxes raised by priests. It is always necessary, however, to read between the lines of History. A writer resisted in his own way by withdrawing in 1941 to the solitary confines of an Alpine pasture in the Hautes-Alpes department. There, under very precarious conditions, he produced a work extolling peace and humanity that was published after the war. A powerful book that merits a new look. Elian-Jean Finbert intermingles philosophy and the story of his life in the high pastures, hidden from the Nazis, in this book written during the Occupation. His thoughts weave in and out with his pastoral work, each feeding the other and coming together in a harmonious fullness. An excerpt. Marc Riboud is drawn to both the resistance efforts of people around the world and the beauty of mountain landscapes. His road leads from a young girl with a flower (a rose!) to the foggy summits of Huang Shan, a path of resistance against stereotypes and clichés. Paradoxically, a school for upper-echelon civil-service officials set up in the Alps by the Vichy government assisted Resistance fighters, notably in the Vercors, and became the cradle for the People and Culture network. What remains today of that social initiative ? Three mountain men in the fight against tyranny. The heroic, medieval story of William Tell united a diverse country and created the legend of the rebellious Alps. Yet Switzerland is not exclusively mountainous and the temptation to withdraw in isolation threatens the claim to independence. An (im)pertinent look at the paradoxes of a national myth that cuts both ways. Should one take to the hills to save linguistic diversity ? That could be one interpretation of this call to arms by a lover of the language who takes on both language fads and academic rigidities. Refreshing. It is on the Glières plateau, where the Resistance fighters waged a major battle during the Second World War, that the now famous text Indignez-vous ! was written. Over three million copies have since been sold in Europe. Some activists discuss. Resistance blossoming beneath the snow ? Is a counter-culture to the apolitical nature of tourism and the marketing of the Alps in the process of emerging on the high slopes, beneath the ski lifts ? That is what a few premonitory signs would seem to indicate in the form of the strikes by seasonal workers and acceptance of ecological ideas, to say nothing of pluriactivity workers attempting to redefine their lives. The image of Hannibal and his elephants in the Alps fired imaginations and gave birth to a veritable myth. Under what conditions did he cross the Alps over steep terrain occupied by hostile populations ? How were the Carthaginian general and his epic voyage perceived and presented ? Those are all questions dealt with by the new exhibition at the Musée Dauphinois in Grenoble. In Austria, Lake Wolfgang is as romantic as anyone could wish. Made famous by an operetta, the idyllic site, very reminiscent of Mozart, draws large crowds that threaten the local identity and culture. The inhabitants have succeeded in maintaining a certain balance between their traditions and the tourism offering… at least until now. 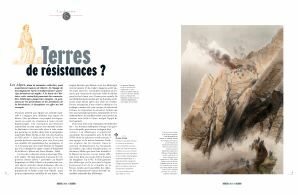 L’Alpe 54 : Résistances, aux Alpes, citoyens ! L’Alpe 54 : Widerstände, Wohlauf Kameraden, auf den Berg! L’Alpe 54 : Resistenzen Alle Alpi, cittadini!